Create custom types for calls and meetings to have a better understanding of how your sales team is spending time. In the left sidebar menu, click the Sales dropdown and select Call & meeting types. Click to toggle the Enable and customize call and meeting types for your team switch on. Click an existing type to edit it, or the trash icon delete to delete it. After calling a contact from HubSpot, click the Select call type dropdown menu to select the call type. When you manually log an activity, click the Select call type dropdown menu to select a call type when you Log a call, and click the Select meeting type dropdown menu to select a meeting type when you Log a meeting. When you schedule a meeting with a contact, click the Select meeting type dropdown menu to select the meeting type. Hover over your meetings link and click Edit, or create a new meetings link by clicking Create meeting link. On the Details screen, click the Meeting Type dropdown menu and select a meeting type. HubSpot offers a few default reports for calling and meeting types, such as Call and Meeting totals (by Type), and Call and Meeting Leaderboard (by Type) which can be added to your dashboard. 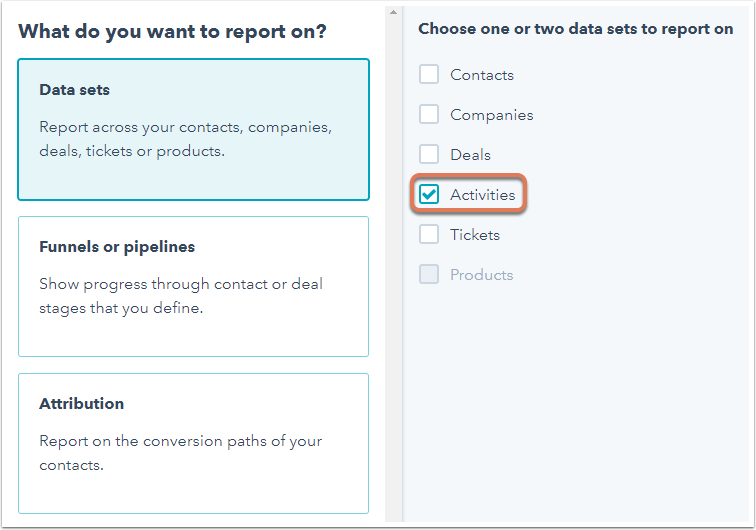 If you have a Professional or Enterprise subscription or the Reporting add-on, you can create a custom report on your call and meeting types by selecting the Activities checkbox when prompted to choose a data-set. Once this is done, you can select Call and meeting type as a filter.